I’ve learned there are three things you don’t discuss with people: religion, politics and the Great Pumpkin. What a fantastic recipe for a fall dinner party and of course the lasagne would be nice on Thanksgiving if you’re not wedded to a traditional American Thanksgiving menu. Pretty inspiring and I can’t wait to try more of his recipes, but for now with a few adaptations I must say that I was pleasantly surprised with the lasagne, simply roasted pumpkin, onions and garlic seasoned with fresh sage, thyme, grates of nutmeg. All tossed together with chopped chives, ricotta and grana padano cheese. I was a little confused when I read the recipe, the top layer was the pumpkin mixture, asparagus, cream and cheese, but the photograph clearly showed the top layer as lasagne sheets, so I added the layer of pasta and made a quick béchamel to finish the lasagne before baking at 350° 40-50 minutes or until hot and bubbly in the center, resting for 15 minutes before serving. Keep in mind that the filling and asparagus can be made the day before and then assembled before baking. Heat the oven to 350°, toss the pumpkin, onion, garlic and oil and spread on to a baking sheet. Season with salt and pepper and half of the sage (leaves torn), thyme and a few grates of nutmeg. Roast until tender and golden, cool completely. You can discard the garlic, but I mashed it in with the ricotta etc. Add the chives to the ricotta and toss in the pumpkin, gently mashing into the cheese. Cook the pasta in plenty of boiling salted water, De cecco noodles for about 4-5 minutes, cooled, drained and dried on clean towels. 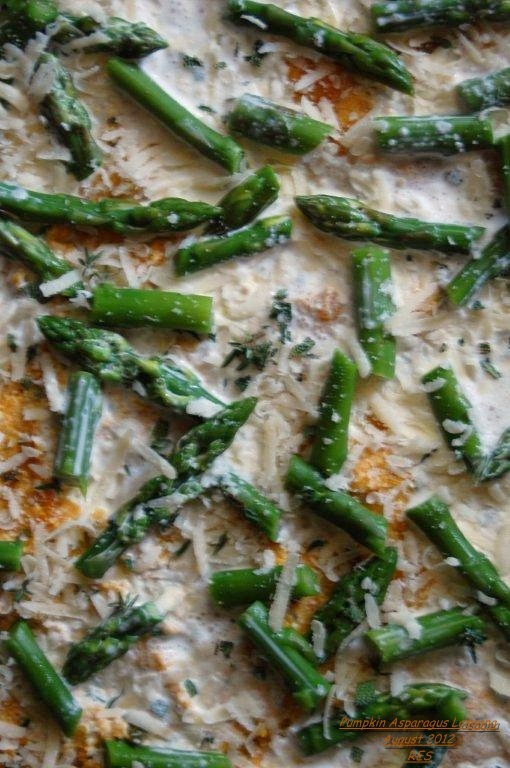 Butter a lasagna pan, pour in a little cream and spread around, layer noodles, pumpkin and asparagus, sprinkle with some of the grana padano cheese and some of the torn sage and thyme leaves. Add a little more cream and then again layer the noodles and ricotta-pumpkin. 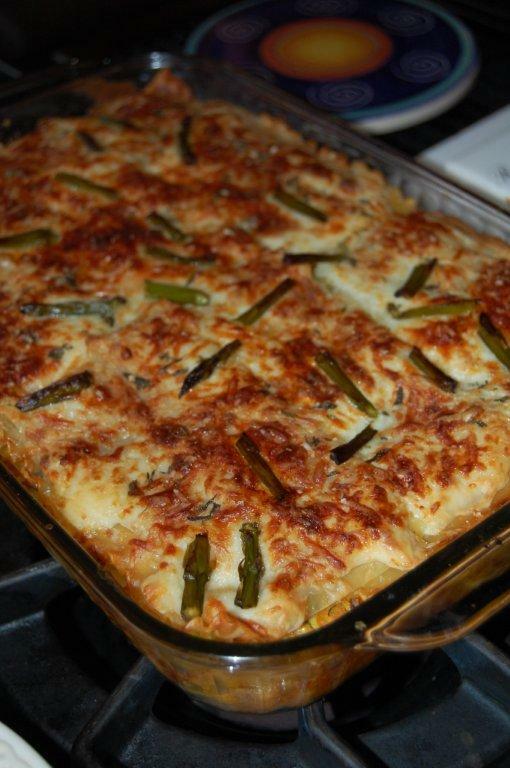 As I mentioned, the recipe seems to end with the top layer of pumpkin, asparagus etc, but I ended with a layer of noodles and béchamel, cheese and asparagus. Bake 350° 40-50 minutes, rest for 15 minutes. Served with roasted green beans and a wonderful spinach salad made by Jean, thanks Jean. Now to back up to the appetizers, Pam’s bruschetta-sausages, tomatoes, olives, bocconcini tossed and served with crusty grilled bread and a plate of fresh figs and prosciutto. 4 Italian sausages sliced in half lengthwise, place into a dish and add 1/4 cup olive oil, 2 cloves finely chopped garlic, 4 dill sprigs, leaves removed and chopped, and season with salt and pepper. 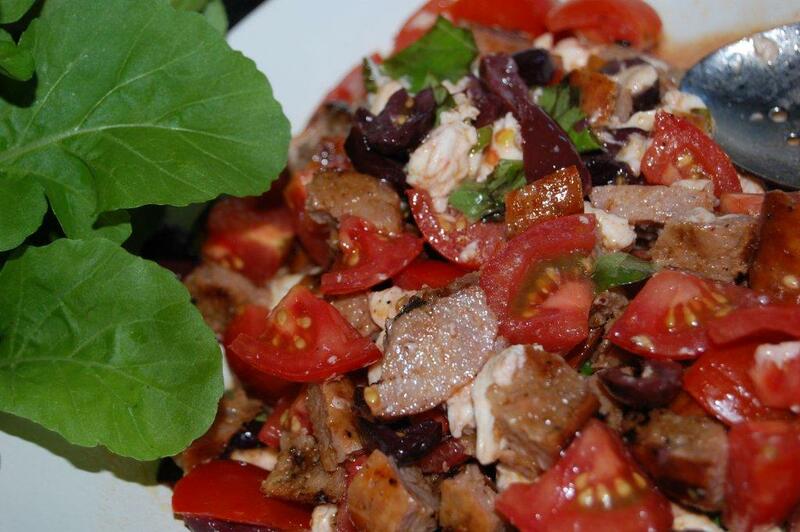 Toss and marinate while you prepare in a bowl, a bunch of arugula, 4 quartered ripe tomatoes (I used Camparis) a handful of fresh torn basil leaves, 1/2 cup pitted black olives, rough chopped, 8 torn bocconcini, and white (salt-packed)cleaned anchovies, all tossed with 1/4 cup EVOO. Grilled at least 8 slices of crusty Italian sourdough bread and rub with garlic, grill sausages and cut into large pieces. I let the sausages cool and then tossed into the salad, but the photo shows the sausages on the toast then salad over, doesn’t make much difference I suppose, but one note if you toss the sausage and salad together early, leave out the arugula until serving time. 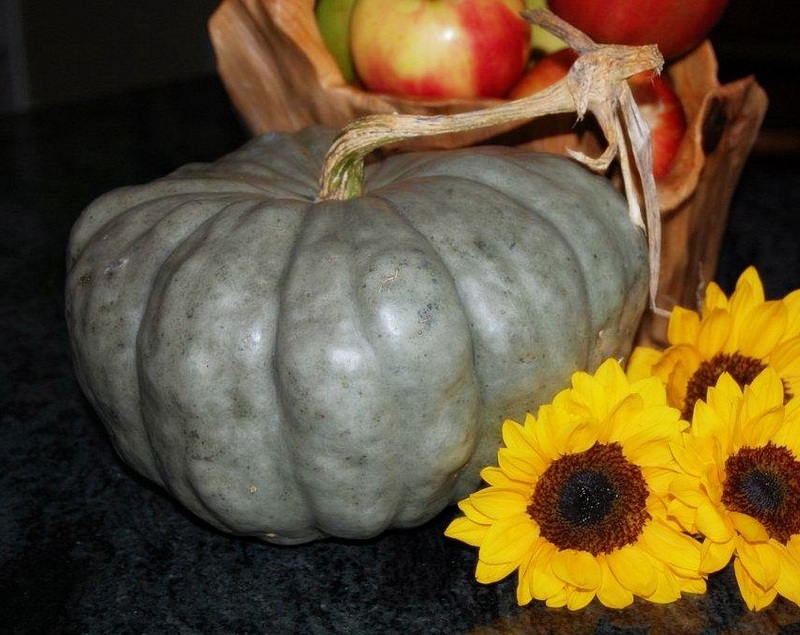 Posted on September 24, 2012 by ibbeachnanaPosted in Pasta Main dishesTagged great pumpkin.